Walmart Inc. is all set to announce its deal to purchase a 70% stake in Flipkart. On a post money basis, i.e. after including the value of the fresh capital infusion, Flipkart is being valued at $21 billion, Mint has reported. But the large cheque Walmart is writing for a foothold in India’s retail market may not be its last. Flipkart is a cash-guzzling operation, and may need fund infusions every few years. It has burnt cash worth $2.32 billion (Rs15,600 crore) between FY15 and FY17, according to the company’s filings in Singapore sourced by paper.vc. 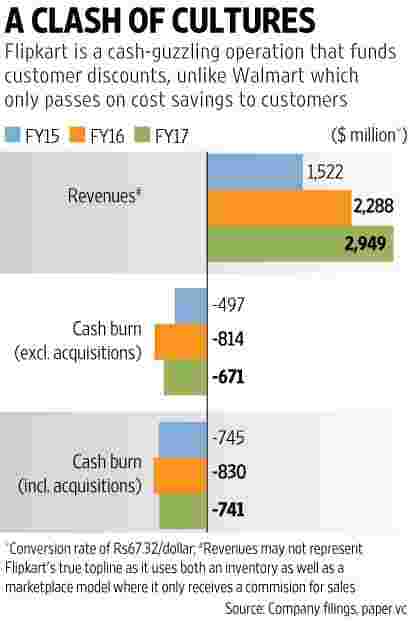 Excluding outgo on acquisitions, cash burn added up to $2 billion (Rs13350 crore), using current exchange rates. From the sounds of it, cash burn may have risen since then, after a hefty fund raise last year. “(Cash) burn is not a metric that anybody worries about any more. And with the fund-raise, burn is almost irrelevant." Kalyan Krishnamurthy, chief executive officer at Flipkart, said in an interview with Mint. Of course, the Walmart deal, which also involves an investment from Alphabet Inc., will result in another huge cash infusion in the company. But with the rate at which Amazon.com Inc. is burning cash in India, a moot question is how many years Flipkart’s cash reserves will last. It’s difficult to get a handle on the company’s topline or gross merchandise value from its reported financials. In FY17, Flipkart reported revenues of Rs19,855 crore on a consolidated basis. But this includes gross sales of its subsidiary that uses the inventory model, as well as commissions earned by another subsidiary that uses the marketplace model. Hopefully, Walmart’s press release announcing its acquisition will have clearer details of Flipkart’s topline. Without a clear topline number, it’s pointless trying to figure out Flipkart’s gross margins. Even so, it’s worth mentioning that the purchase price of the goods it sold is listed at Rs18,404 crore. The company reported a loss before accounting for tax credits of Rs8,895 crore in FY17, up from Rs5,467 crore the preceding year and Rs2,985 crore in FY15. But FY17 results include a mark-to-market loss on derivatives instruments worth Rs3,400 crore, adjusted for which losses were more or less in line with FY16 levels. Cash burn, defined as net cash flow from operations less capex and cost of acquisitions, fell to Rs4,991 crore from Rs5,589 crore in FY16. Excluding the cash outgo on acquisitions, burn rates fell even more—from Rs5,479 crore in FY16 to Rs4,517 crore in FY17. But as pointed earlier, cash burn is expected to have picked up since mid-FY18 after the large fund-raise from Softbank and other investors. Regardless of the price Walmart announces for its purchase of Flipkart, its investors should note that investments are likely to continue in the future. As pointed in this column earlier, this will prove to be a test of patience for Walmart investors, who have been accustomed to steady and growing cash flows for years now (bit.ly/2jJ2R0H). Also, the US retail giant operates on the business model called EDLP/EDLC, where it takes costs out of its business and passes on the savings to customers (bit.ly/2woxxNP). Flipkart’s business model of funding discounts to customers—using investor money—is evidently new territory for Walmart, and it remains to be seen where things settle at after the two cultures clash. And it’s not like Flipkart has reached a stage of maturity, where cash burn is negligible. Investment needs in the industry will remain high, both because penetration is low and also on account of the maverick Amazon breathing down one’s neck. And return expectations need to be tempered by the fact that average order values are low in India and logistics costs are high. Also, as Michelle Grant, head of retailing at Euromonitor International says, market shares for the largest five e-commerce markets show a pattern, where there is one dominant company followed by a relatively distant second and a lot of other smaller companies. Unless Walmart beats Amazon in India, it stands the risk of ending up a relatively distant second, and not enough to show for its top-dollar investment. For now though, the prospect of bolstering its growth prospects using its large cash reserves seems to be tempering down investors’ concerns.